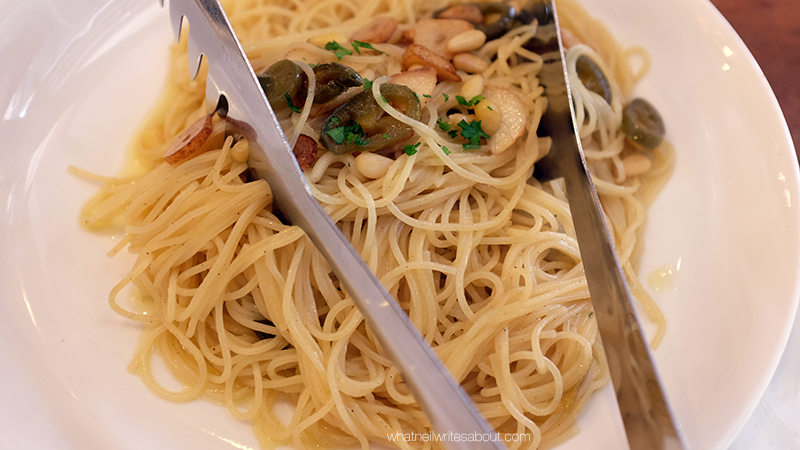 I don't know about you but after having fresh pasta, I get cravings now and then. What's worse is that it isn't satiated by those noodles you get from the supermarkets that you dip in boiling water to reconstitute it. Mama Lou's is one of the restaurants I come back to if I want homemade pasta with simple recipes but become amazing because of the fresh ingredients and are cooked well. After asking my friend about how to take care of a beagle for a couple of days, I asked her if she had any recommendations for a restaurant to try. She said that the last restaurant she came to where she was 'pleasantly surprised' was Mama Lou's. Apparently, she couldn't get over the Risotto. You'll feel right at home here! 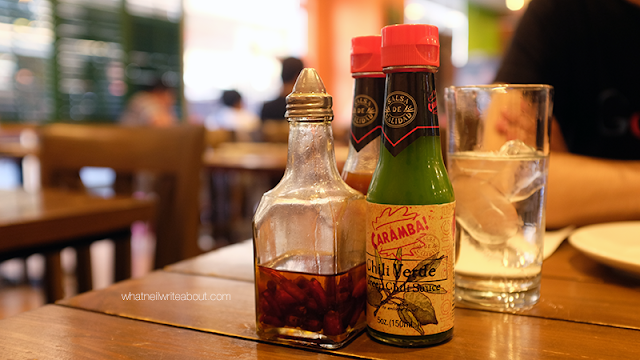 Mama Lous has several branches in the Metro, the one I am nearest to is in UP Town Center along Katipunan Avenue. 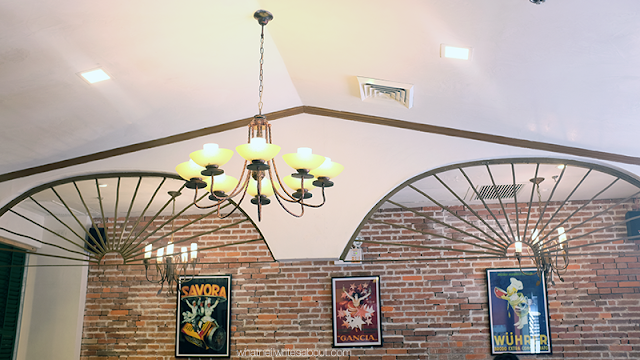 Once you've arrived, you will notice the decor is inspired by houses from Italian villages like the one in 'the Godfather' where Michael was exiled in. You will feel right at home with its warm and family oriented touches like the green wooden window blinds and the vintage-style chandeliers. It feels like you're going back in time. I love it. Although at around 12 noon, people started to flock the place and got a little too noisy. It was bearable but should be noted if you want a place to stay, relax and talk with your family and/or friends. We were given the menus and we decided to get a dish from each pasta category. 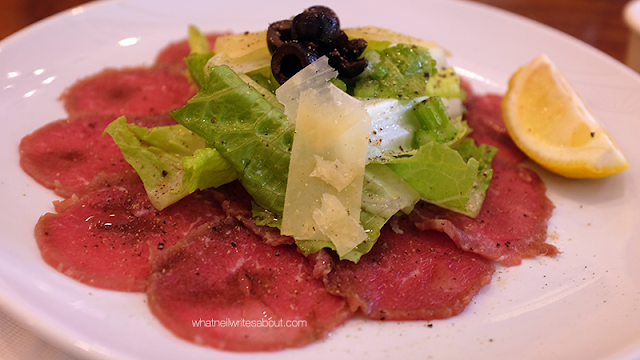 For appetisers we picked the carpaccio. For my main course, I've developed a habit wherein I either pick the best sellers of the establishment or the most unique, eye catching dish I could find. In this case I got the Japaleno of the category Barilla Pasta - Diavalo. (Diablo) From context, I gathered it was spicy which furthered my resolve. The Jalapeno was interesting because I've never had garlic, Jalapeno and pine nuts in pasta before and they go so well together! The flavors from the Jalapeno blend well with the pine nuts where the spicy kick is balanced by the volume of olive oil. 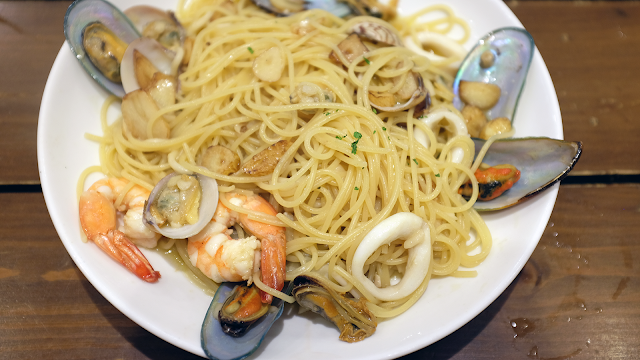 The other Olive oil based pasta we had was the spaghetti seafood olio (The banner picture of the article) which is a simple garlic sautéed with assorted seafood but had this saltiness to it that was addicting. What really surprised me about the dishes the generous serving of olive oil and yet I never felt overpowered or felt sick of it. I wanted its generous oiliness as oppose to other oils. This lasagna melts in your mouth like cake! My brother decided to have the Lasagna, which I argued that we could have anywhere else. He was firm though and I am glad he was. When I took my first bite, I was blown away because during those few seconds the flavors from the red sauce mixing with the flavors of the cheeses and the the pasta itself exploded in my mouth. What surprised me the most is the overall consistency of the Lasagna which was like a cake, the layers quickly melted as it touched my mouth! I had to have another bite! We also had the Spaghetti Pomodoro Basilico which basically the classic red sauce Spaghetti with Mama Lou's delicious pomodoro with basil! It had the same flavors as the lasagna just with a different experience because of the texture and shape of the pasta. 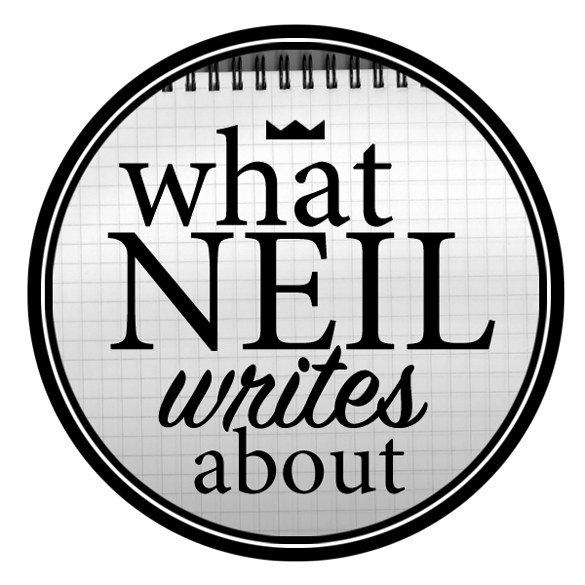 It's good, it's just it isn't anything new. 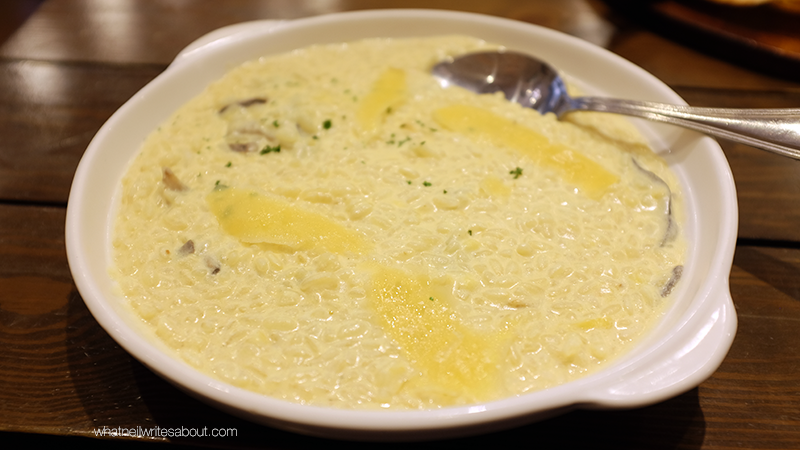 The risotto's thick cream reminded me of a strong flavored carbonara's white sauce cooked with full rice grains which is pleasantly tamed by the saltiness of the cheese and the consistency of the mushrooms. It's absolutely wonderful, with the only gripe is how easily you can get 'umay' because of all the starch that comes from the rice and cream. I tried countering this by having some pizza and more pasta. I ended up eating the whole plate! There were dishes that weren't as impressive as the best dishes which means it was decent because it was cooked well but just didn't have anything remarkable. Most of the pizzas are a pretty good example of this. 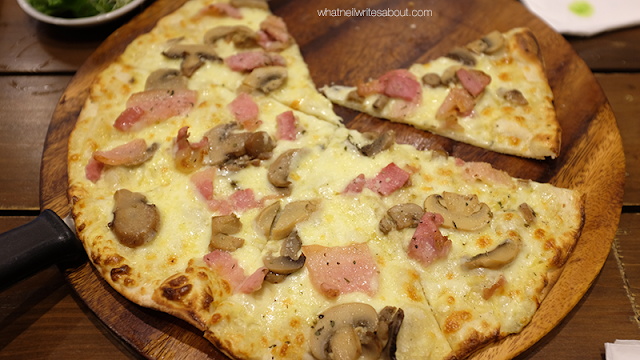 The crust is thin and crunchy while the sticky cheeses have hints of saltiness that go well with the bacon and mushrooms. I couldn't put my finger on it, it just felt that it was missing that X-factor but in any case they are still worth trying! I never really got to use these because the dishes almost never needed them! We arrived and were immediately led to our table and were then given the menus. 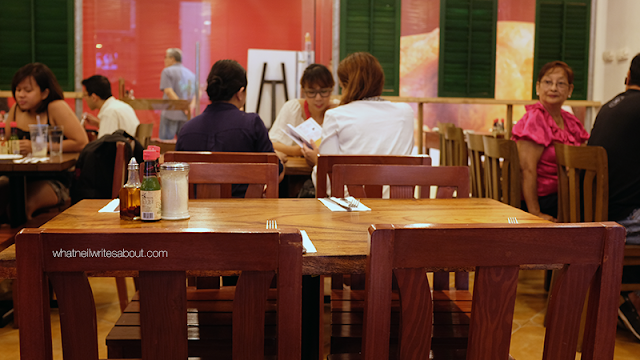 The Waiter was patient and answered promptly the questions we threw at him about the dishes. Waiting time was around a little over fifteen minutes where all the dishes were given in quick succession. Whenever we would have special requests like extra tissue or to refill our glasses with water was all met quickly and efficiently. Thank you! Their dishes start at Php 160.00 for the poutine and get up to Php 495.00 for the big Cheese/Sausage platters! The price to serving ratio is basically what I would expect for the price and quality! most dishes are simple recipes but are amazing because they were cooked well! 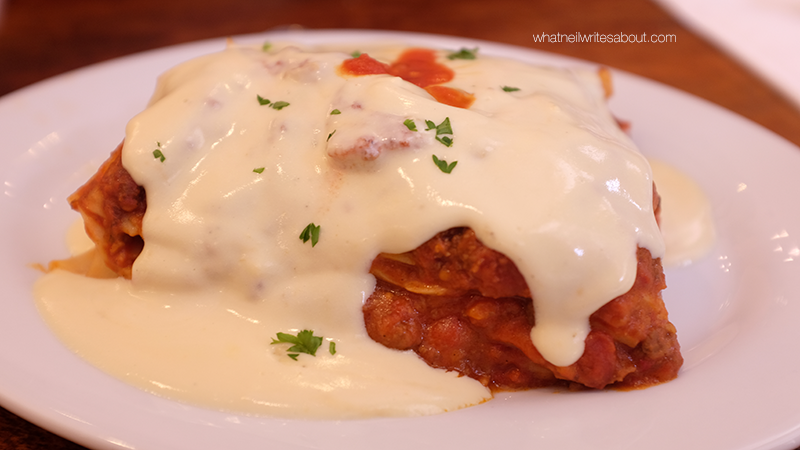 the lasagna that melts in your mouth like cake! jalapeno Pasta is unique and worth the try! the warm and homey ambiance! risotto is amazing but can be troubling to eat on its own. pizza is decent but is overshadowed by the great other dishes! can get noisy and crowded at peak hours!